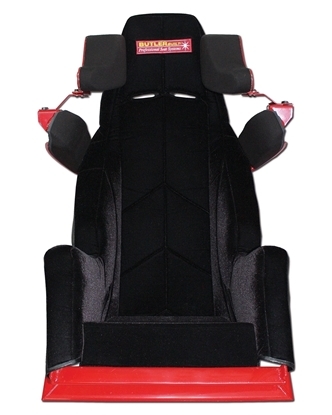 Monster Truck Pro series – professional seat systems by ButlerBuilt. The ProMonster Series incorporates the latest technology and innovations that has made ButlerBuilt the premier aluminum seat manufacturer. Multi-layer, multi-density foams provide superior impact absorption and driver comfort for today's ultra-high performance Monster Truck machines. The new Gen2 Monster Truck seat offers our integrated seat-belt technology where lap and crotch belts are mounted to the seat. Left and right-side slugs allow belt and seat-to-frame mounting via same slug.